Isabelia puchella is another of our delightful miniature species from the Mata Atlantica, Brazil. Isabelia pulchella has a very different growth habit to Isabelia virginalis (day 330) but similar pretty flowers about 15mm across. 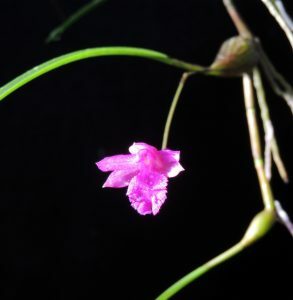 The plant forms a mass of small single leaved pseudobulbs each 3cm away from the previous bulb. We find that this habit is well suited to growing plants in a basket so that the plant forms a ball covered in little pink flowers each December. 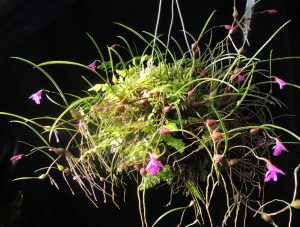 The plant is native to mossy cloud forest and so appreciated regular watering and keeping our plant well watered for the past four years has resulted into a good growth of moss on the basket which the plant clearly enjoys.